You never know if Santa Claus is going to come down the chimney at this time of the year. You can be good for a couple of periods, and still be unsure if you’ll get that nice present you wanted from the man in the red suit. 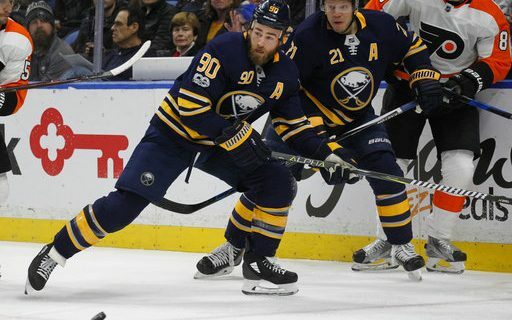 Happily for the Buffalo Sabres, they received a reward for their efforts on Friday night – a fluky goal that helped them take a 4-2 win from the Philadelphia Flyers before 18,222 in the KeyBank Center. While the entire team benefited, the main recipient of the gift was Ryan O’Reilly. After the Sabres had gone 0 for 30 or so in their shots in the first two-plus periods of the then-scoreless game, the center threw the puck at the Flyers goal. O’Reilly was merely hoping something good would happen, realizing that you can’t score if you don’t shoot. “Especially from those angles, you never know,” O’Reilly said. Somehow the puck eluded Flyers goalie Brian Elliott and dribbled into the net. After 103 minutes and 59 seconds of not scoring goals this week, the Sabres had finally got a bounce. Until that point, the contest more or less resembled Tuesday’s blanking against Boston. Buffalo played well against the Flyers, and probably deserved to lead after two periods – but couldn’t score. This time, there was no letdown after going unrewarded. Once O’Reilly scored and everyone in the building with an interest in the Sabres exhaled, the two teams put on a good show. It started when Buffalo picked up a pair of overlapping penalties, giving the Flyers a five-on-three for 40 seconds. But Philadelphia couldn’t capitalize. “That was a huge momentum boost,” goalie Robin Lehner added. Evander Kane added to that momentum with a fine tip-in on a shot from the blue line by Josh Gorges. The 2-0 lead looked relatively safe with less than three minutes to go, but these are still the Sabres – who rarely do anything the easy way. Michael Raffl got the Flyers within one with 2:10 left, but Eichel scored into an empty net with 1:07 to go. Some fans got up to leave, and probably did a U-turn when Shayne Gostisbehere narrowed the gap to 3-2 with 32 seconds left. But after another nervous moment of two, Eichel got another empty-netter – the first Sabre in history to get two in a single game. With less than a second left, it really was safe to go home and trim the tree. Lehner must have felt he’d been given a wonderful holiday gift. It’s been rare for him to get four goals of offensive support in a single game. The win should give the Sabres a mental boost through the holiday break, since the game ended a three-game winless streak. Buffalo vacates the arena for a couple of weeks now, going on a seven-game road swing that includes an outdoor game in New York on Jan. 1. The Sabres’ next home start is on Jan. 9 against Winnipeg.